Besides growing all these veggies, it is fun to eat them! I have shared my cold cucumber and beet soup as well as the zucchini salsa with my community garden group. I have made the salsa for the wine tasting group and for a pot luck. 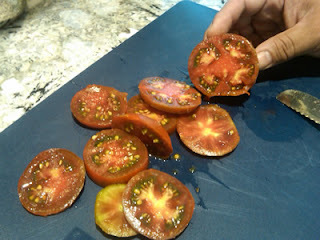 This past weekend I was able to combine some of my garden with a friend's garden pickings. I have LOTS of basil----and my friend only planted tomatoes. So I called him to see if any of the tomatoes were ready---and the answer was yes! 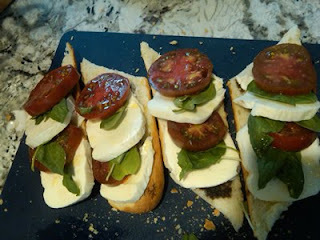 I cut some basil and picked up a baguette and fresh mozzarella cheese. My friend opened the expensive bottle of olive oil from Chef....and below was the creation of all the pieces from our gardens. The food was delicious....but it was even better sitting on the front porch and sharing it with a friend.